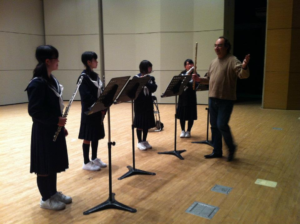 To learn flute playing is one of the best decisions anyone can make for himself. 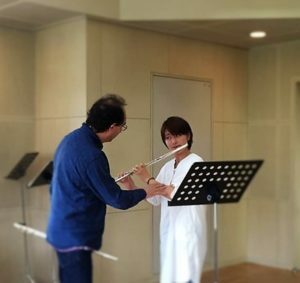 For a young kid, learning the flute is a great opportunity to structure the brain, develop musical sensitivity, and open a door to a world of sharing music with others, without any kind of borders. It will become a great source of deep long-term satisfaction for any child who decides to learn music at a young age. For an adult, it is the same (although adults have different expectations of themselves based on their mental, physical strengths and weaknesses). Whether for a child or an adult, this exciting adventure must start in the hands of a good teacher. A flute teacher must be someone very special in many ways. He or she has to be a true visionary guide. A great teacher must have a strong background as a highly skilled player and have a passion for transmitting this knowledge to students. To be clear, I am not saying the flute teacher should be a “Flute Star”! Some performers do not like teaching, even if they are great players. It’s best to find someone who is a great player and a passionate teacher. Private Lessons are a great way to learn. As teacher and performer for over thirty years, I have come to realize daily how important it is not to compromise on basics. Sound production, air use, breathing, phrasing, musical styles, focus, mental mindset, and precision of rhythm are all important basics that the right teacher can provide guidance for. Those basics exist to make playing easier and more logical. They contribute to developing playing with the least limitations possible, thus opening the door to the fun that everyone is looking for in making music with others. Whatever is required of the student (like patience and regular practice) are the same qualities your teacher must have. Together you can open a new world of musical possibilities! Thanks to Sarah Busman for collecting and editing Mr. Duchamp’s words for our blog. 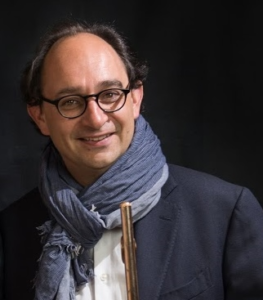 Are you looking for a flute teacher? Visit our teacher directory to find the perfect person for you!